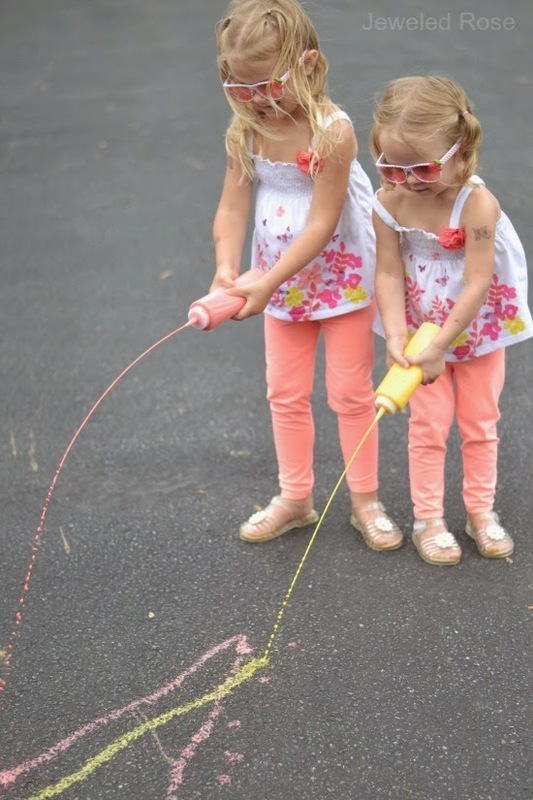 Playing with sidewalk squirty chalk is one of Rosie and Jewel's favorite Summer activities. Today, I whipped up a new batch and added a fun little twist to their play. 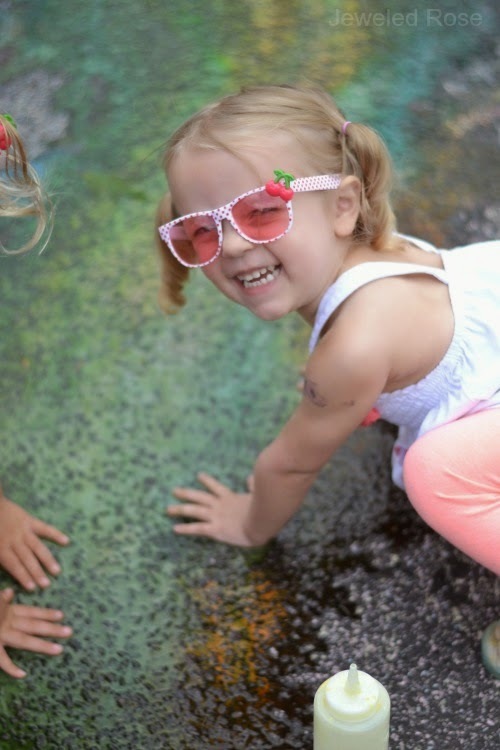 The girls were wowed by this MAGIC color changing chalk, and they got to create art, explore science, and review color theory. 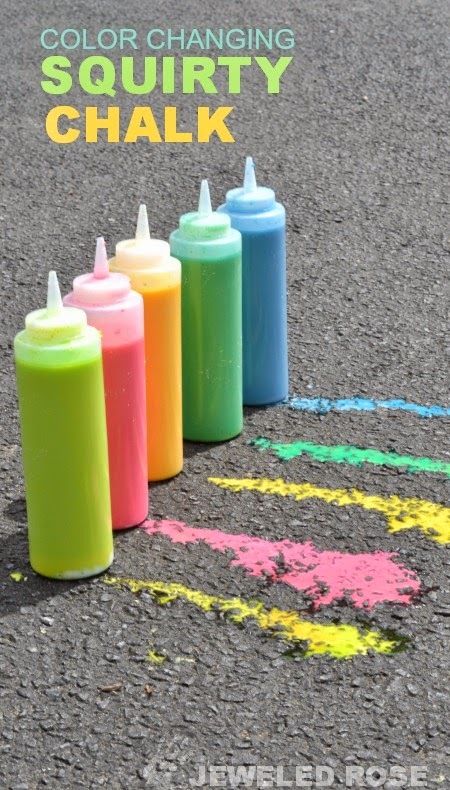 You will want to use six squirt bottles to make the magic color changing chalk. 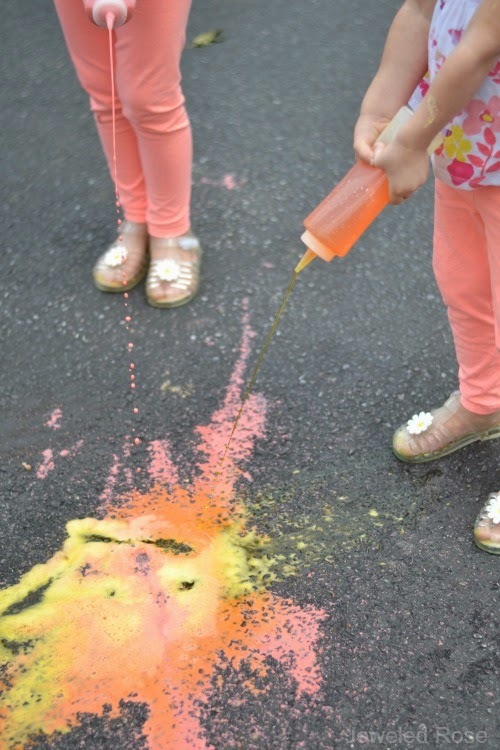 Fill three of the squirt bottles 2/3 of the way with a baking soda and corn starch mixture. I free poured and used roughly the same amount of both ingredients. Add a few drops of food coloring to each bottle, and then fill them the rest of the way with water. 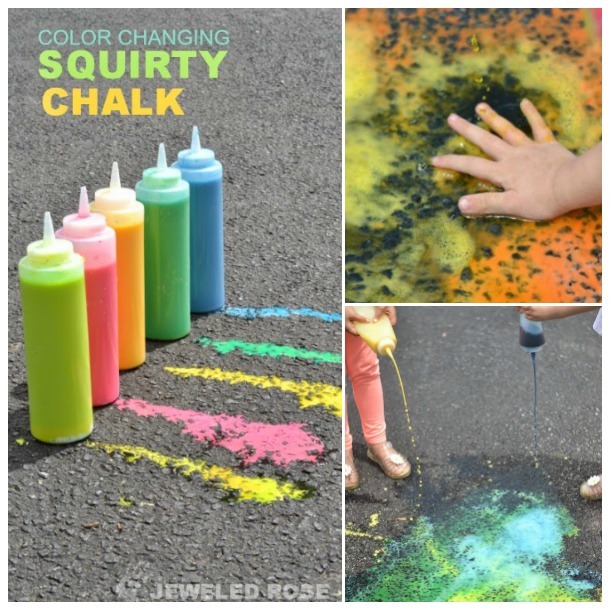 You will want to make one red, one blue, and one yellow chalk. Use a butter knife or similar to stir the chalk, and then place the cap on and shake the bottles well. Fill the remaining three bottles with vinegar and add food coloring to each bottle. You will want one red, one yellow, and one blue vinegar. Head on outside and play can begin! 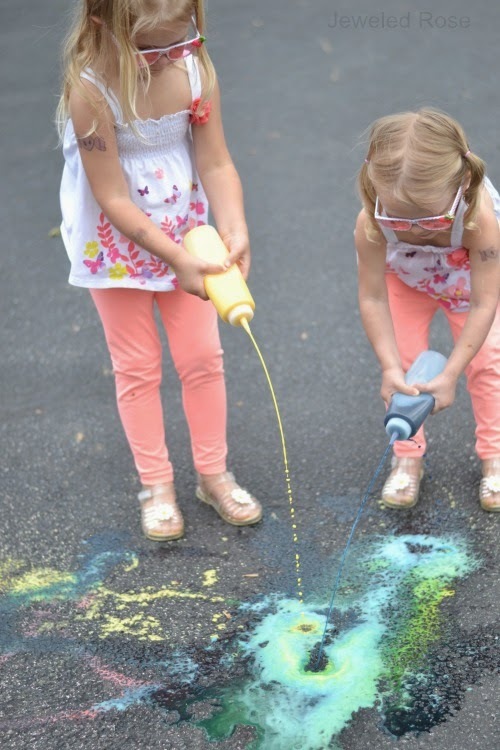 Rosie and Jewel had a lot of fun creating art on the pavement, and they loved squeezing the paints from the bottles. 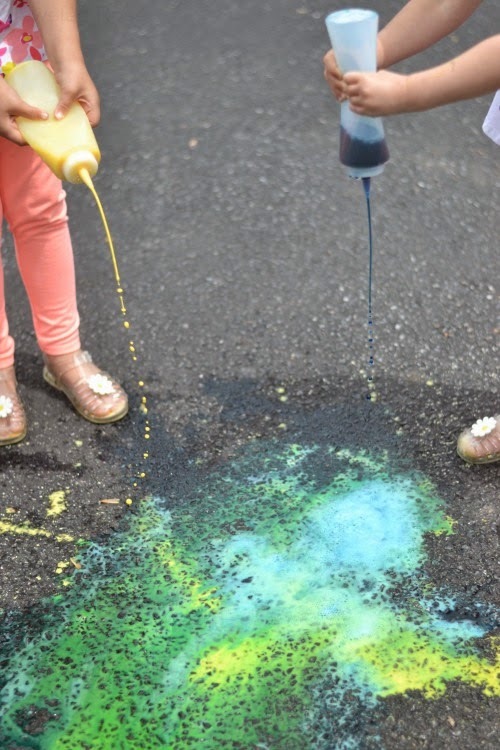 The yellow chalk and the blue vinegar combined to make fizzing green art. 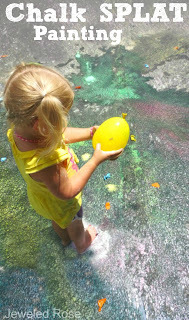 The girls loved watching the colors blend to create a new, magically fizzing color. 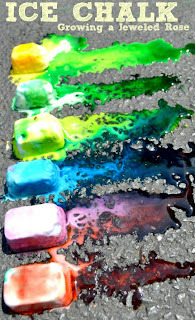 They also loved making their street art erupt, a fun lesson in science. 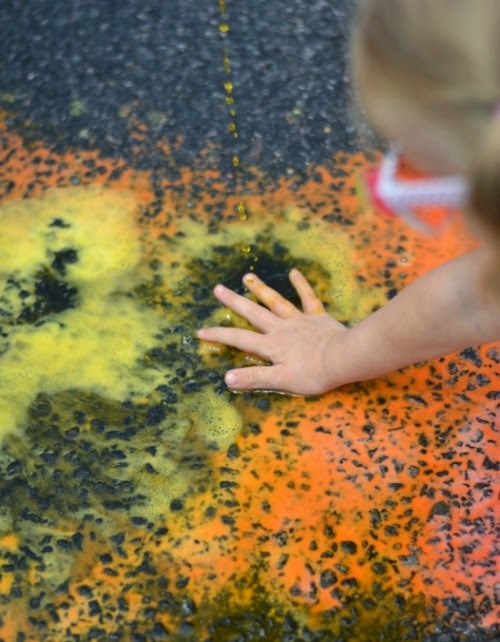 This was such a fun way to explore science and color theory while creating street art outside. When play time is over you can easily wash any mess away with a hose, or you can leave the art displayed until next rain fall. 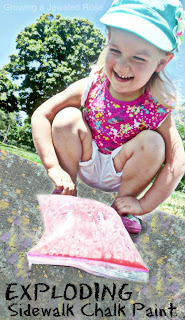 A Few Tips: I recommend wearing play clothes during this activity, as the food coloring could stain clothing. 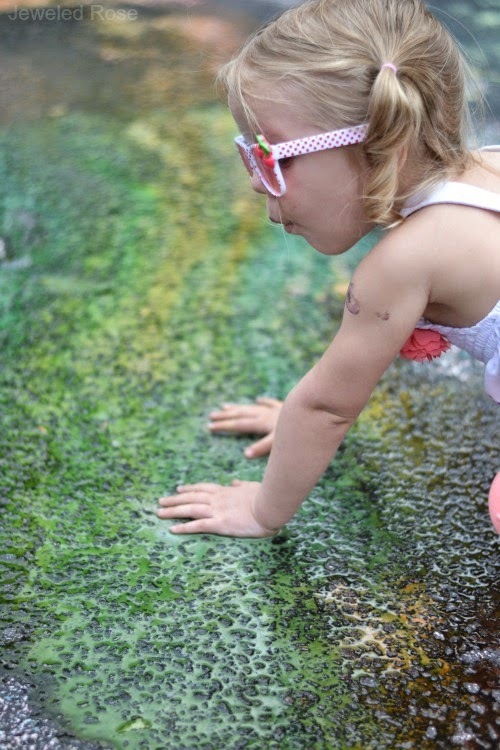 You could also use washable watercolors to color your chalk instead of food coloring, and this would eliminate any possible staining. You can find squirt bottles in the kitchen gadget aisle of Walmart for $1 a piece. You can also get them online here for just a few dollars.